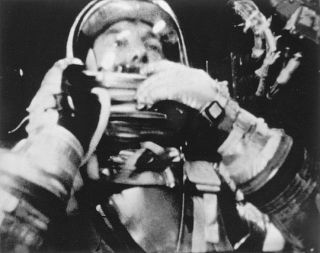 AlanShepard will be honored on a 2011 U.S. postage stamp wearing the silverspacesuit in which he made history as the first American astronaut to fly intospace. Thestamp's design, which was quietly released last week by the U.S. PostalService (USPS), shows Shepard from his shoulders up centered between images ofhis rocket lifting off and his capsule above the Earth. Thepair ? or "se-tenant" ? of space-themed stamps was revealed in theUSPS's annual report for 2010, which was posted to the postal service's websiteNov. 15. The two stamps are displayed with other commemoratives planned fornext year as a lead in to the report's financial section. Asfirst announced by the USPS in August, thestamps ? titled "Alan Shepard: First American in Space" and"First Spacecraft to Orbit Mercury" ? were designed by sciencefiction artist Donato Giancola, who worked with former Air & Space magazineart director Phil Jordan. Timedto coincide with Messenger becoming the first spacecraft to enter orbit aboutMercury on March 18, 2011 and the 50th anniversary of Shepard'sMercury-Redstone 3 flight on May 5, the stamps are the first space-themedreleases by the USPS in more than a decade. Inaddition, the Shepard stamp will mark the first time the U.S. has honored anastronaut with his own postage. Long standing rules require individuals to bedeceased at least five years before they can be considered (Shepard died ofleukemia in 1998) and events of "historical significance" areeligible only on anniversaries in multiples of 50 years. Whilehonoring Shepard as the "FirstAmerican in Space" ? as the stamp's inscription describes ? the designomits reference to Shepard also having been the fifth out of only 12 men to thewalk on the moon. TheMessenger stamp is the third to depict a mission to the closest planet to theSun, though the first dedicated specifically to the MErcury Surface, SpaceENvironment, GEochemistry and Ranging, or Messenger, probe. The previous two ?issued in 1975 and 1991 ? honored the first spacecraft to fly by Mercury,Mariner 10. Accordingto Linn's Stamp News, a weekly newspaper for stamp collectors, the stamps'artwork as published in the USPS annual report is preliminary and final designsare to be released late next month. Possiblechanges however, are expected to center mostly on the denominations. The postalservice plans to change all of the first-class stamps to be "forever"stamps, which can be used to mail a one-ounce letter regardless of when thestamps were purchased or used, and no matter what the postage rates may be inthe future. Visit collectSPACE.com to see images of thetwo recently revealed space stamps to be issued by the U.S. Postal Service in2011. Copyright 2010 collectSPACE.com. All rightsreserved.